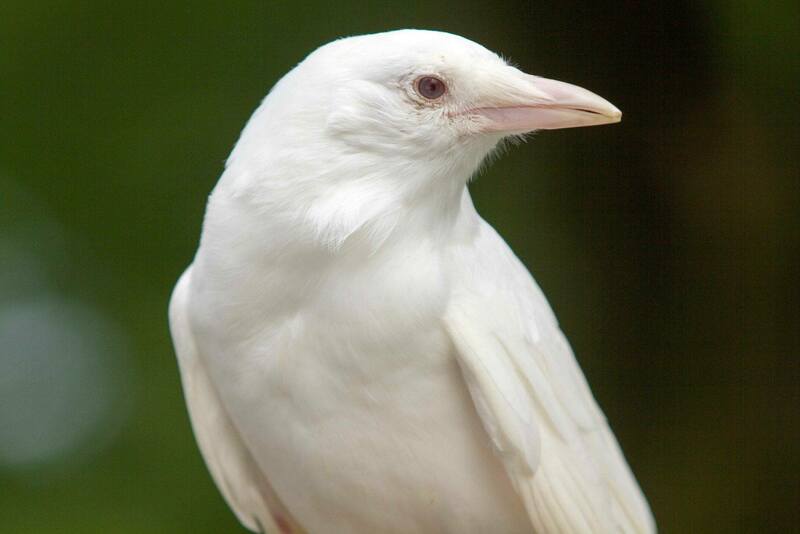 One of our most pop ular wildlife ambassadors, Einstein is an albino crow. Found as a fledgling under a tree after a storm and delivered by his finder, Einstein has become an integral part of our education programs. 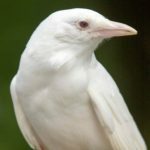 The lack of pigment in his feathers has caused them to be very brittle and they tend to break and crumble, making him unable to survive in the wild. Crows are among the most intelligent and intuitive birds in the world, and Einstein has learned a few words on his own and greets each volunteer as they arrive to help out. His favorite color is orange, and he is afraid of plastic bags! 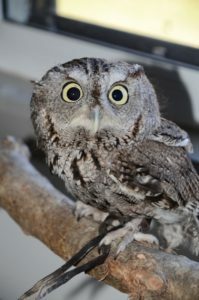 Screech owls are the second smallest species of owls native to Pennsylvania. Gandalf is a gray-phase Screech owl whose injuries, sustained when hit by a car, preclude flight good enough to live in the wild. Gandalf helps us demonstrate the adaptations that make owls exceptional night hunters and he is a wonderful foster dad for orphaned owlets. 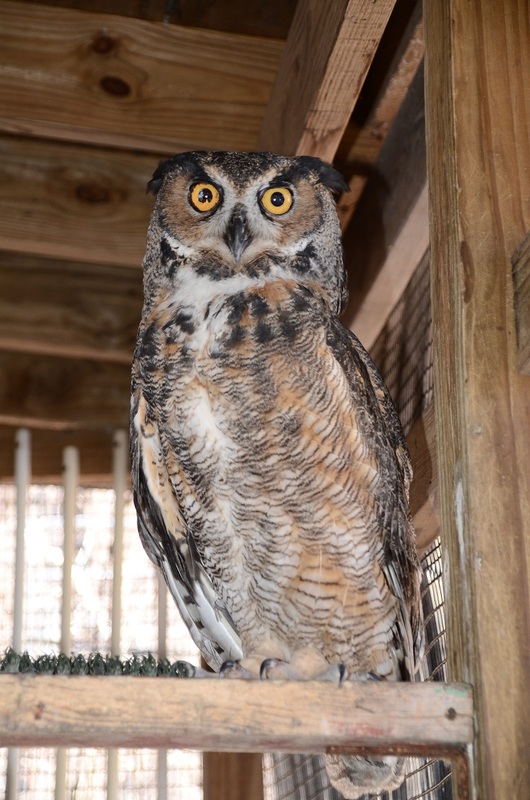 The la rgest and most powerful owl native to PA is the Great-horned Owl. Maxima is certainly impressive. She sustained a wing fracture when she was hit by a car many years ago. The surgery to repair her bones was successful, but tendon and ligament damage prevents her from flying higher than 6 feet. 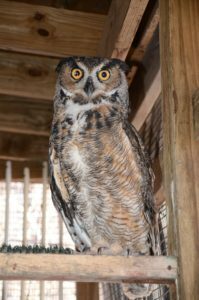 She is a very protective foster mother to all the orphaned Great-horned owlets received each year. Audiences are always impressed when we share her hearing “super powers”! Not very imaginati vely named, RT, a Red-tailed hawk, was our very first survivor of West Nile Virus, well more than a decade ago. The high fever and brain inflammation caused RT to have depth perception issues that never resolved. He was not expected to survive, so he never received a “better” name.. and here he is with us 15 years later. 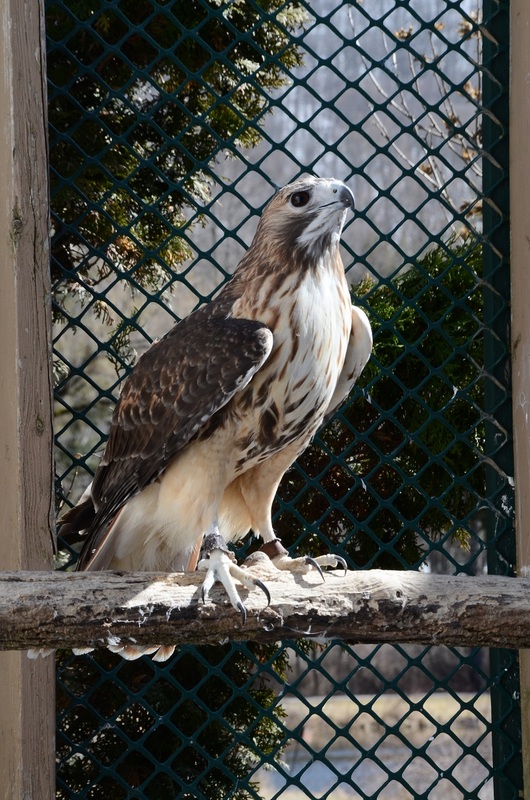 RT helps us convey the exceptional visual prowess hawks and falcons possess. A smaller cousin of the Red-tailed hawk, the Red-shouldered hawk makes up for its smaller size with a bigger voice! Rusty lost the end of his wing when he was struck by a car. 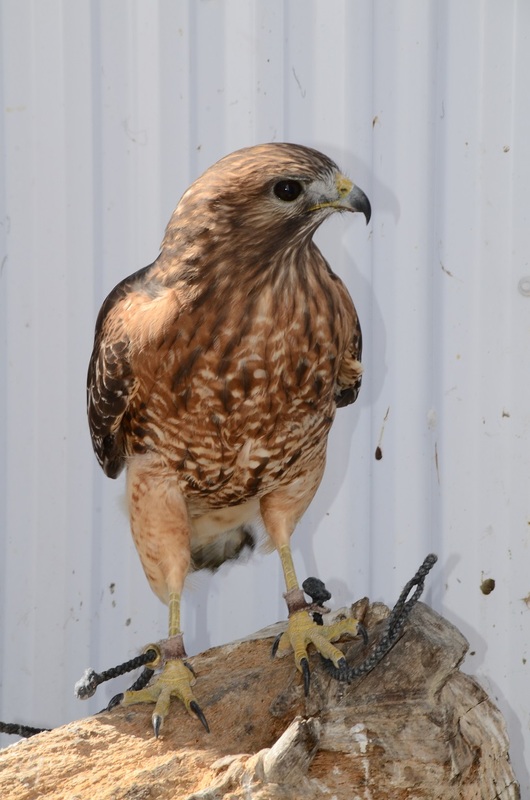 He has a big personality and helps demonstrate the characteristics that make a hawk a hawk. The Barred owl is the second largest o wl native to PA. With big, soft, brown eyes, Barred owls deliver the awwwww factor. Owliver helps us demonstrate how big these owls appear, but when I place my fingers through his feathers, the true “not so big after all” becomes clear. 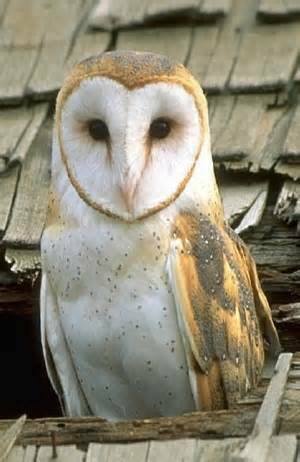 Barn owls are unlike an y other owl in the world. They are small, weighing less than a pound, and make the scariest screeching sound in the world! 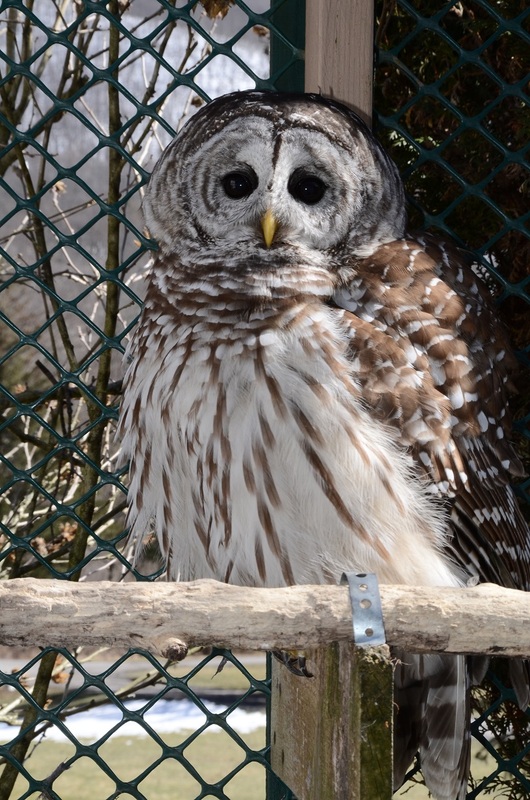 They have small eyes for an owl, allowing for a highly developed facial disk for superhero style hearing. Farmers around the world value these birds and allow them to nest in their buildings. A pair of barn owls feeding babies can catch and kill more than a dozen mice each night! 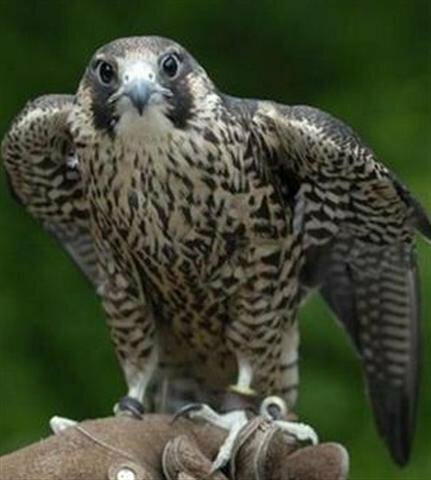 Peregrine falcons are the largest of the falcons in PA. Handsome and majestic, Zeus commands attention at every presentation. Falcons are the fastest birds on the planet, and most of their prey is birds. 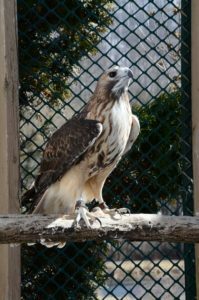 Zeus helps us demonstrate the special features and adaptations that make falcons unique predators. Zeus is fed dead quails, chicks and large mice. 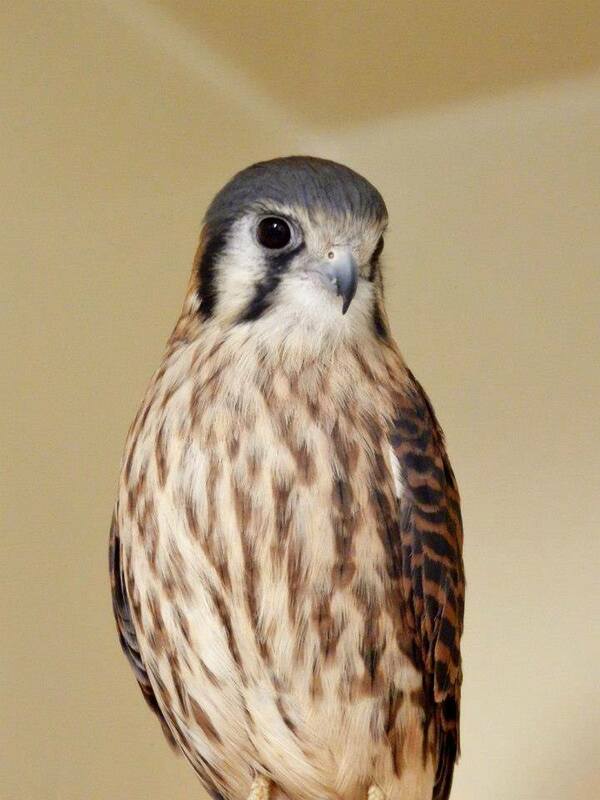 American Kestrels are the smallest falcons in North America. They are also the most charismatic. Thor is a male kestrel. He truly does believe he is big and tough, even though he only weighs just over 4 ounces. Kestrels are true animal-helpers, eating many species of insects and birds that can be pests to people. Susie is Thor’s friend. In most raptors, the girls and boys look alike except that the girls are bigger. Susie weighs about 5 ounces. Kestrels are an exception. Males, like Thor, have blue gray wings and are more spotted on their reddish brown body, and females, like Susie, are reddish brown all the way around with lots of bars and streaking. Merlins are the least well-known falcons in PA and are intermediate in size between Peregrines and Kestrels. Merlin suffered a leg and eye injury in 2017 and is just starting to join us at wildlife programs, but he is enchanting and has a very big personality. As falcons, the Merlin’s primary food is birds, and so, he is fed quail, chicks and occasionally mice. 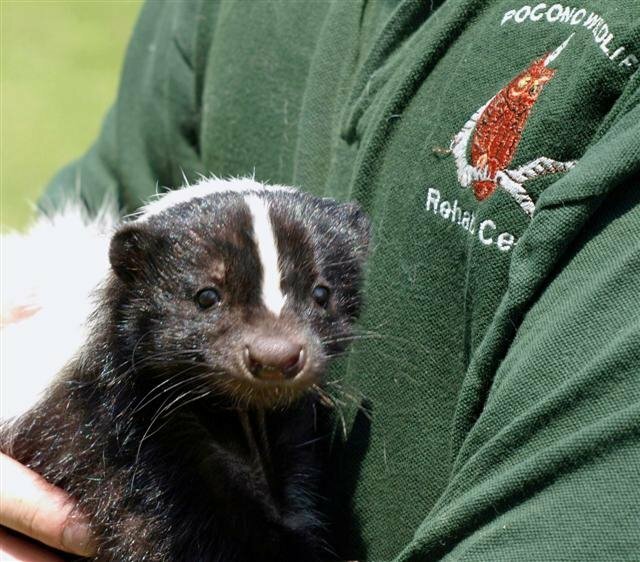 Abigail and Madeline are domesticated skunks that we obtained from a licensed breeder in PA. They both play very important roles in teaching people about living around skunks including dealing with the spray and understanding the dangers of rabies, but also the role skunks play in reducing populations of destructive insects around our homes. Abby and Maddy demonstrate the adaptations that allow them to be successful nocturnal creatures. Opossums are the newest superheroes on the block. The only marsupials in North America, Blossom sports a pretty nifty pouch on her belly. 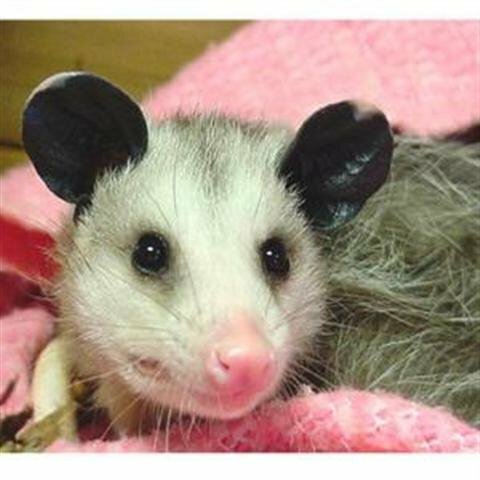 Opossums carry no disease threat to people, but do make our properties safer for us by eating dead things that can breed bacteria, maggots and flies. They also have a large appetite for ticks, eating thousands of the nasty little blood-suckers each year. Blossom helps us demonstrate the adaptations and features that make these primitive mammals unique. 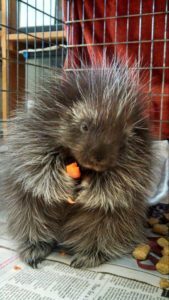 Spike is our captive-bred porcupine. She is one of the most popular of our education ambassadors, not so much for her not-so-beautiful aroma, but more for her absolutely adorable face and interactive personality. 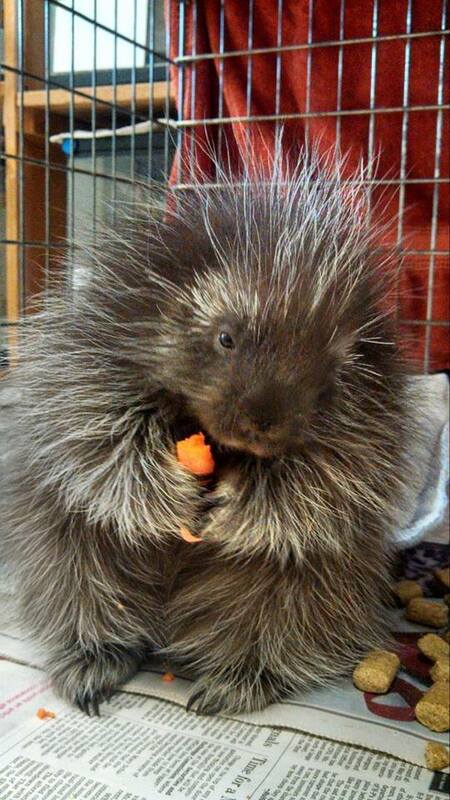 Porcupines are the second largest rodents in PA, and they live mainly in trees. Spike demonstrates the kinds of hair on her body, which include about 300,000 sharp quills, long curved nails, and her insatiable appetite for fruit and salty snacks like pretzels! Gideon is a captive-bred Gray fox. 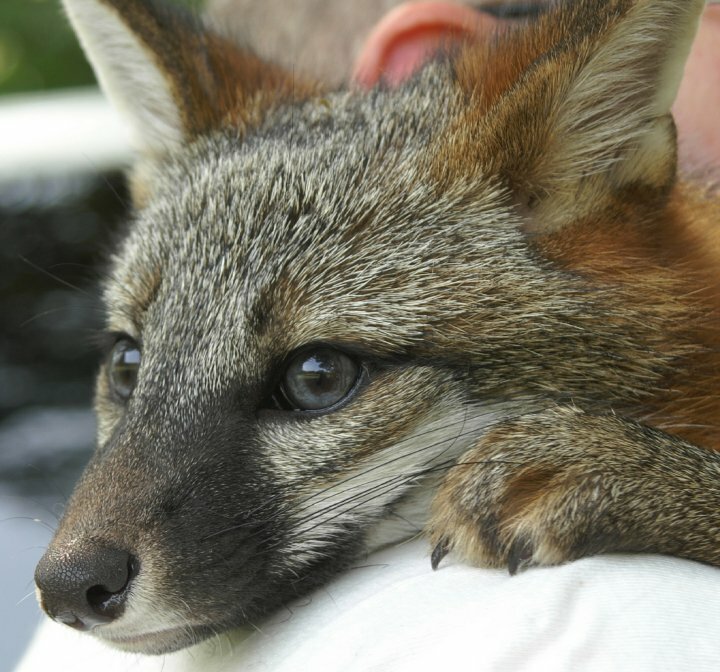 He has been with us over a decade and he helps people learn that gray foxes are forest-dwelling omnivores that can climb trees and eat lots of rodents, fruits and nuts, and insects. Gideon is intelligent and curious. His favorite treats are apple, large mealworms and raw venison meatballs! Reptiles are essential ambassadors for education. Snakes are fascinating to some and reviled by others. In any case, their value in controlling disease-spreading and potentially destructive rodents around homes and businesses makes them invaluable members of the natural community. 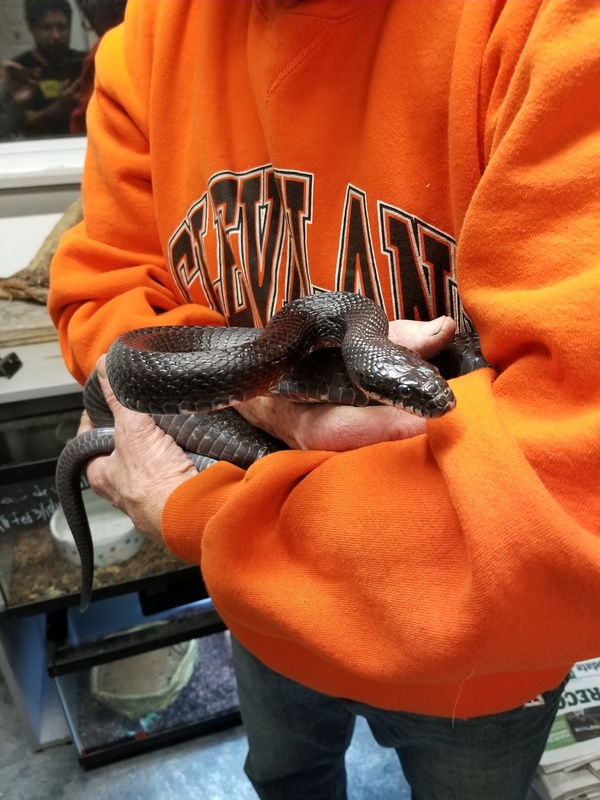 Our beautiful black rat snake helps us demonstrate their adaptations and to distinguish between venomous and nonvenomous snakes in the northeastern US. Our little hognose snake is a western species that is very similar to our native Eastern Hognose Snake. Hognose snakes are small, harmless snakes that have amazing defenses! A favorite with children, we share this snake’s ability to look dangerous and even play dead if need be! 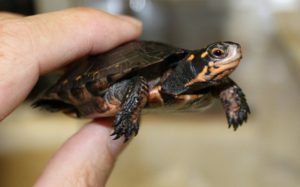 Eastern Box turtles, like all terrestrial turtles in PA, is a species whose populations are in peril. 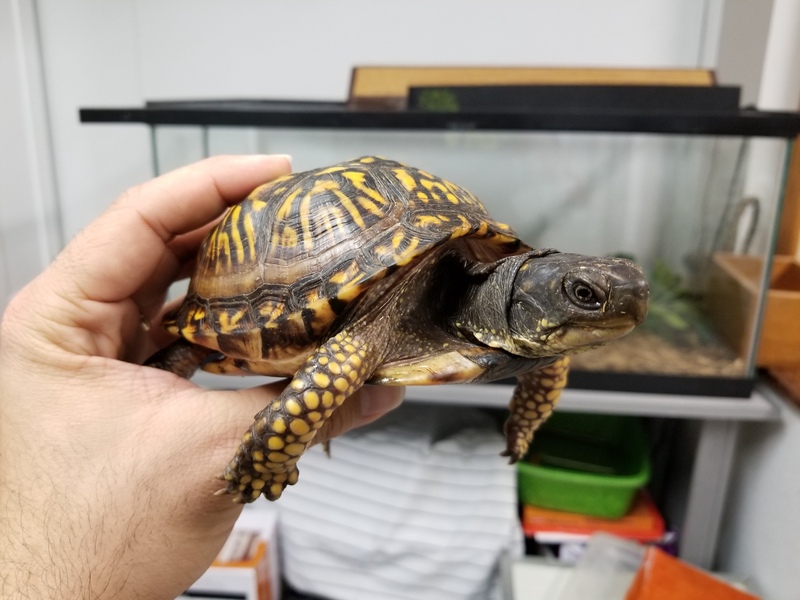 Our ambassador box turtle will assist us in demonstrating the fascinating adaptations that turtles uniquely possess. We also discuss why turtle populations are in decline and how to help them. Another of our threatened terrestrial t urtle species, the wood turtle is one of the most beautiful. With its orange neck and legs, it is quite colorful. When hiding, though, the reason for its name becomes obvious! Wood turtles look like wood! Our Wood Turtle helps audiences learn about these active and intelligent turtles, learn about the shell, habitats and how people can protect wild turtles.